On Friday, October 5, 2018 at 12:07 a.m. Regina Stokes Johnson received her heavenly wings to join her Lord and Savior. She accepted her wings peacefully as she was surrounded by her family. Regina, known affectionately by her husband as “Gee” and to many others as “Mama Gee” (this name given by her oldest son Kevin). Her sister Delphine begin calling her “Gina-Tae” which became a name of love and endearment to others. All those names are a representation of the life she lived and how she showed love to others. Regina was agreeable, easy to talk to, selfless, kind, helpful, patient, considerate, understanding and generous. These are only a few adjectives to describe her personality. Regina had a way of making people happy not just through her demeanor and personality but through their stomachs. She could cook and bake. Her yams and cakes…Uhm Uhm Good! Her husband says noone can make chicken salad like his Gee. Her favorite color was blue. As Regina was strolling to get lunch one day she met the love of her life Ron. That stroll led to a love story which lasted 34 years. Their union which begin on February 24, 1984 was a true testament of the vows until death we do part. Regina graduated from Nottoway High School in 1972. After graduation, Regina moved to Richmond, Virginia and attended and graduated from Smithdeal-Massey Business College. She began her employment with the Commonwealth of Virginia at the Virginia Employment Commission, known as the VEC. She was employed with VEC for 20 plus years before moving to Charlotte, NC with her family where she resided for 13 years. Regina picked right up where she left off being her loving self and making friends which became extended family. She became employed with Wells Fargo in Charlotte, NC and worked there until she and her husband relocated to Blackstone, Virginia. Her employment with Wells Fargo continued as she traveled the road each day to Richmond, Virginia. Her husband was her road companion in good or bad weather. She worked for Wells Fargo until her health no longer allowed her. Regina joined Spring Hill Baptist church at an early age and served even after moving to Richmond. While living in Richmond she attended Sixth Baptist Church. Upon moving to Charlotte, she and her family (husband and children) joined Friendship Missionary Baptist Church under the Pastoral of Rev. Clifford Jones, Sr. When moving back to Blackstone, Regina was reinstated to home church of Spring Hill. Regina was very instrumental and compassionate in serving her church and community. She was a member of the Usher Board, SHBC Choir, Inspirational Choir, Hospitality and Tutoring Ministry. She was always willing to help serve wherever needed. Once again being known for her cooking ability, she cooked cakes, banana and corn pudding whenever asked. Regina was a member of the American Cancer Society Nottoway Relay for Life Team. She supported the team both financially and served on all fundraisers. Regina was a loving wife, mother, grandmother, sister, aunt, cousin and friend. She greeted everyone with that beautiful smile and a big hug. Noone was a stranger. When you met her for the first time her genuine display was everlasting. 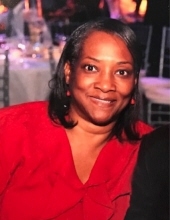 Regina enjoyed going to Jazz, Gospel, 2nd Street festivals, concerts, and traveling. She was a mother to many. When she traveled with her daughter’s AAU team (Charlotte Lady Stars) as Team Mom, parents who were not able to travel to the games entrusted their children with Mama Gee. She truly loved her family and supported and attended every family function. Regina was preceded in death by her mother, Dorothy E. Stokes, her father, Charlie Stokes, her mother-in-law, Maria Smithers, brother, Charlie Stokes, Jr. (known as Bubba), and her sister, Marion Brown. Regina came from a big family and was proceeded in death by numerous aunts, uncles and cousins. Regina will be remembered for her kind spirit and big heart, as she would do anything for anyone. She leaves to cherish her memories a loving and devoted husband of 34 years, Ronald Johnson, Sr., three children, Kevin Stokes (Regina) of Blackstone, VA, Ronald Johnson, Jr. (known as RJ) of Arlington, Virginia, and Raven L. Johnson of Raleigh, NC; five grandchildren, Janaiya, Little Kevin, Vineasha, Janaria, and Jocelyn of Blackstone, VA; one God-grandchild, Miles Porter of Richmond, VA; two God-children, James “LA” Fowlkes, IV of Blackstone, VA, and Warreneka Porter (Ryan) of Richmond, VA; two sisters, Alice Barner (William), and Delphine Simmons-Fowlkes (James, III); four uncles, Charlie Harris (Doretha), Joseph Lee Harris (Betty), and Richard Harris of Richmond, VA and Robert Lee Campbell (Mary) of Baltimore, MD; one aunt, Martha Stokes Walker of Blackstone, VA, Margaret Campbell of Baltimore, MD; five nephews, LeVar Barner (Jessical), Terrell Hickson, James “LA” Fowlkes, IV, John Fowlkes, and James Brown; three nieces, Cassandra Brown, LaNeisha Barner, and Makiya Fowlkes; four great nieces, Sydnie Johnson, Karma Hardy, Kario Brown, Cassidy Brown, Clarissa Brown; two great nephews, Jashone Brown, and Jaylen Coaker. She became close to one of her co-workers who later became known as her adopted daughter, Nicole Williams of Richmond, VA; The Johnson Family (her in-laws) were very instrumental and loving in her life. Their bond was so strong you could take away the in-law and just know they are family; through Regina’s children and her love for people she had many adopted children, sisters, and extended family members. Her first cousins were like her sisters and brothers, and a host of cousins, friends, and church family whom will treasure their memories of time spent with her. Funeral Services Saturday, October 13, 2018 at 1:00 p.m. at Springhill Baptist Church, Blackstone. Interment church cemetery. To plant a tree in memory of Regina S. Johnson, please visit our Tribute Store. "Email Address" would like to share the life celebration of Regina S. Johnson. Click on the "link" to go to share a favorite memory or leave a condolence message for the family.